What Are the Dangers of Soy Protein? People have eaten soy for nearly 5,000 years. One of the most notable advantages of soy is that its protein content and quality is comparable to that of animal foods. While soy contains a variety of advantages, including the ability to help reduce the risk of heart disease, it also has some potential health concerns related to soy -- specifically, certain soy products that are high in isoflavones, such as soy protein isolate. Most of the concerns with soy protein are related to high consumption levels, while moderate consumption seems to be safe and beneficial in most cases. Soy products contain varying amounts of protein. 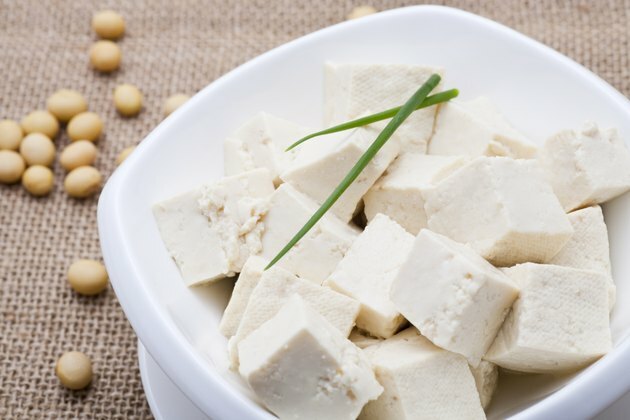 Foods that contain soy protein isolate, for example, have the highest amount of protein, followed by soy flour, whole soybeans and finally, tofu. This is important because the potential negative side effects of soy may be related to the level of proteins and isoflavones in soy. Foods that have added soy protein and isoflavones can react differently with the body than whole soy foods such as tofu, soy silk and miso, according to Penn State College of Agricultural Sciences. Foods with higher levels of isoflavones can potentially increase the risk of cancer. Isoflavones are a component of soy, which act as weak estrogens, once they're inside the body. While there is research supporting moderate soy consumption to prevent breast cancer, high soy intakes can also increase the risk for cancer. Penn State College of Agricultural Sciences notes that when it comes to isoflavones, more doesn't mean better. Consuming high levels for extended periods could have negative effects. The recommended intake should be between between 35 to 55 milligrams per day, according to the Penn State College of Agricultural Sciences. The isoflavones in soy may be particularly dangerous for breast cancer survivors when consumed in high doses, notes the Linus Pauling Institute. A moderate consumption of 11 g of soy protein per day, however, may actually be beneficial to breast cancer survivors. Soy is widely used in infant formulas, with nearly 25 percent of the formula sold in the U.S. soy-based. Soy formulas have relatively high levels of isoflavones, which has raised concern about the potential long-term effects of soy formulas on the development and immune function of growing children. While no current evidence exists that infants' soy-based formulas cause adverse effects, MedlinePlus notes that there is insufficient evidence on the safety of these. For this reason, the National Institutes of Health does not recommend products that contain soy isolate protein for children. The safest way to consume soy foods is to consume them in their natural forms, such as tofu or tempeh. Other soy food such as soy milk, soy cheese, soy nuts and soy burgers can also be safely consumed at a level of 2 to 3 servings per day, for healthy men and women. For women at high risk for breast cancer, soy can still be safely consumed once or twice a week. If you're concerned about potential dangers of soy, supplements should be avoided, as they typically contain higher levels of isoflavones than soy foods. What Are the Dangers of Too Much Soy? Should I Be Eating Soy?